When alumni reflect on their Austin College experiences, it doesn’t take long for faculty names to enter the conversation. In fact, the agenda for every official gathering of alumni should include a moment to honor faculty—because that moment likely will happen regardless of planning. Alumni tell some stories with laughter and others with a tear or two, but all with appreciation for the men and women who have helped shape their lives. The tradition of academic excellence at Austin College indeed has its foundation in a team of experts in their academic disciplines—experts dedicated to teaching and learning, with students their foremost priority. Administrators and current students join alumni in acknowledging the quality of the Austin College faculty; recognition comes from many other sources, too. Several current and emeriti faculty members have been honored with Minnie Stevens Piper Awards for teaching or selected as Fulbright Scholars who have shared their talents around the world. The faculty includes a past CASE Texas Professor of the Year and many who have been recognized for excellence within an array of prestigious professional organizations. Each spring, three faculty members are recognized for teaching excellence at the Austin College Honors Convocation. One receives the Excellence in Teaching Award; the other two are put forth as the College’s nominees for external teaching awards—considered Austin College awards and providing stipends, as does the Excellence in Teaching Award. This spring’s awardees, along with another year-end honoree, are offered here as examples of the excellence of Austin College faculty. One commonality binds these educators: they define their work not in research or in grading or giving lectures, but in mentoring their students and inspiring them to discover and reach toward their own potentials. Howard Starr completed 47 years on the Austin College faculty this spring, certainly placing him among the longest-tenured faculty at the College, if not the longest. “I’ve seen so many buildings come and go, I can probably tell you where every nail is,” he said. He’s seen a lot—and he’s taught a lot of students. 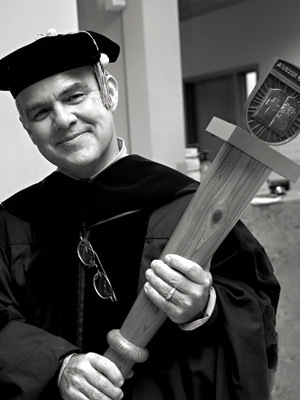 And, this spring, he received the 2012 Austin College Excellence in Teaching Award. 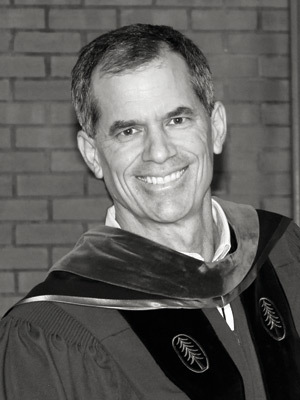 In his many years at Austin College, Howard has added myriad positions to his teaching, from chair of the counseling center to campus ombudsman to dean of educational administration. 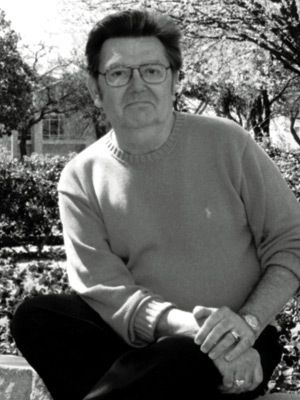 Juggling multiple positions wasn’t always easy: after the construction of Wortham Center, Howard was both a psychology professor and vice president of the now-defunct College Relations Division (including the areas of admission, financial aid, alumni and parent relations, college information, and the mailing and printing services). “There were days when I’d go from the second floor, running departments, downstairs to teach in the classroom there at that time, then back upstairs for another meeting,” he said. But over the years, Howard has held to his first passion: teaching psychology. That passion for his field and for his students has remained constant and has made an impression. He also received the College’s Excellence in Teaching Award 10 years ago. His flagship course is “Death and Dying,” which grew out of his interest in the psychology of hospice. It was a new arena of study when he took it up, and so required that he spend a sabbatical in England to study hospice treatments. He also spent time in Israel studying and exploring the psychology of bereavement. That realization colors his interactions with his students from day one. “I’ll say, ‘I’m Howard—let’s get that ‘doctor’ out of the way. I want you to enjoy this class; I want you to feel the way I feel.’ That can only be done with one-on-one interaction,” he said. His classes, heavily laced with film clips to convey emotion and realism, carry the impression of a one-act play, with Howard front and center as the hypnotic lead. Barely checking his notes, he educates and entertains with frequent stories and asides. And he isn’t afraid to take an intermission—he will pause in his lectures to encourage students to stretch or do jumping-jacks. “Make sure you’re awake!” he says boisterously. Peter Schulze, professor of biology and environmental science, was surprised when he was named the 2012 CASE Professor of the Year nominee. “I have lots of colleagues who are outstanding scholars, so it is quite an honor. But one does have to wonder about a computer error,” he said with a wry smile. Peter is enthusiastic about his subject, making him a good fit for his role as the director of the Center for Environmental Studies. Every other year, Peter now teaches “Prairie Restoration” during January Term, focusing on the College’s Sneed Environmental Research Area. During the course, students conduct controlled burns, do other land management tasks, and track the recovery of the prairie restoration Peter has been leading since 2001. “I think of the Sneed project as ‘hobby research,’ and I think of my ‘real’ research as aquatic ecology, because I have more experience with plankton than prairies,” he said. His aquatic research focuses on plankton ecology, and particularly the effects of sediment in Lake Texoma. “I didn’t intend to add a second research topic. Students led me to try to restore native prairie at the Sneed property. Sneed probably will never again be a true native prairie, but it’s come a long way. The project has grown very opportunistically, but it’s worked out well so far,” he said. Peter hopes to be just as flexible in his classroom. “You can’t do the same things in classes of different sizes,” he said. His classes range from four students to 50. 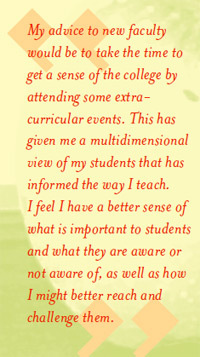 When asked what advice he would give a first-year college teacher, Peter said not to feel obliged to cover all of the “usual” material for a particular course, but rather do more justice to the most important material. “Develop your own courses; don’t just imitate models that you experienced or have imagined,” he said. It’s possible Julie Hempel grew up in the wrong country. And it is. 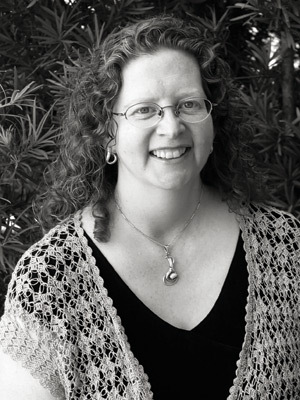 Julie, an associate professor of Spanish, was named a Fulbright Scholar for 2012 – 2013 and began this month to teach and research at the Universidad Autónoma de Querétaro in Querétaro, Mexico, where she will remain until June 2013. She is teaching upper-level literature in English and graduate-level literature in Spanish, and both courses focus on narrative written by descendants of Mexicans in the United States, known as Mexican-American or Chicano literature. In addition, Julie will translate the novel Hasta el año que viene (Until the Coming Year) by Aurora Velasco from Spanish to English, and plans to write additional articles and collect research for the course “Hybrid Identities: Asian Immigrants in Latin America” that she teaches with Terry Hoops, Austin College associate professor of anthropology. “The cultural wall is starting to come down between Mexicans and Mexican-Americans; or, at least, there’s a willingness to start adding some windows,” she said. She feels this study of identity is important for everyone. “In general, every person should reflect on his or her identity. None of us should take for granted who we are, what groups we move in, and how those groups mix to form our identity,” she said. The Fulbright trip has its challenges. “The Mexican education system tends to be much more formal and programmatic,” Julie said. “Moreover, hardly any academics trained in Mexican-American literature have taught there.” It’s rare for Mexican students to have read Chicano stories. “The border is porous when it comes to people and big business, but books don’t make it across the border well,” Julie said. “I’ve become the book ‘smuggler’—not that the books are illegal, but I’m carrying them back and forth.” She is excited about the $750 provided by the Fulbright award to buy materials to use in her class and donate to the host school. Her trip will leave a lasting impact on the Universidad Autónoma de Querétaro—particularly in the library offerings. Language is another challenge. “I’ve never actually been in a classroom with Mexican students learning English, so that will be challenging,” Julie said. But that challenge is balanced with opportunity; most Mexican-American literature written since the 1980s has been written in English, and so is better-suited to an English based course on Mexican-American literature than to her Spanish courses at Austin College. Julie is enthusiastic about Mexico and about teaching. “From an early age, some of my favorite people were teachers. With my early respect and admiration for teachers, when I decided to study Spanish, I decided to teach it, and I found it brought me out of my shell,” she said. She brings that sense of excitement and discovery to the classroom. “I hope for a sense of exploration and dialogue in the classroom, of experiencing something together as a group, trying to lead students but also to let them explore for themselves,” she said. Hunt Tooley is an academic storyteller. Like Aesop’s fables, his tales are packed with lessons for the modern world; unlike Aesop, all of Hunt’s “stories” are true. Hunt came to the College in 1991, and has been connecting the past to the present for students ever since. But he came to teaching only through his devotion to history. “I think I went into teaching so that I could make a living as a historian. The original draw was not teaching, per se, but history,” he said. He found he loves teaching, but remains dedicated to his own scholarship, with particular research interests focusing on modern Europe after the French Revolution. His recent studies analyze the growth of mass brutality, war, revolution, and peacemaking, as well as issues of ethnic identity and ethnic conflict. One way Hunt is able to make connections with history and with his students is by taking students to the places of history. He has led January Term courses on World War I and several on World War II, taking students to battlefields from Normandy to Berlin. He has taught “Imperial Capitals, Imperial Cultures,” and traveled with students to Istanbul, Vienna, Venice, and Rome to see the modern cities for themselves, so to better connect to the cities of the past. His January Term courses also have included trips to Turkey, Paris, the Franco-Spanish border, and the Italian Basilicata. Hunt also can be found outside the classroom, pursuing his other passion: music. He first started playing the trombone when he was 12, and marched in the Texas A&M Aggie Band in college. Now, he plays ukulele and other instruments in Bad Hat, his band, and he has been the principal trombonist in the Sherman Symphony since his first month at Austin College.